On Valentine’s Day, the picturesque town of Banská Štiavnica in central Slovakia turns into the Italian town of Verona, where Shakespeare’s love story about Romeo and Juliet takes place. “Romeo, take me somewhere we can be alone… You’ll be the prince and I’ll be the princess…” the lyrics by Taylor Swift, who was also inspired by the story, read. The first love bank was thereupon open in Banská Štiavnica last year to store everyone’s love in a Love Box. This year, the bank also aims to help 100,000 single individuals find their everlasting love. People all over the world can come to the town or use the love bank’s website to store their wishes. “Our visitors wrote to us many times to thank and tell us that they had found true love after visiting the Love Bank during the first year,” said the Love Bank’s PR manager Katarína Javorská. “Their beautiful stories of wishes fulfilled have inspired us to test if the first real Love Bank really does help people find their true love,” Javorská explained. Love Experiment thus hopes to receive 100,000 love wishes from singles across the globe. They can send or bring their wishes up until Valentine’s Day next year. “The Love Bank has been created from the verses of the world’s longest love poem ‘Marína’, which is officially inscribed as a unique world record in the World Record Academy,” said Javorská. “We placed our wedding photo in a Love Box,” said Veronika and Andrej. 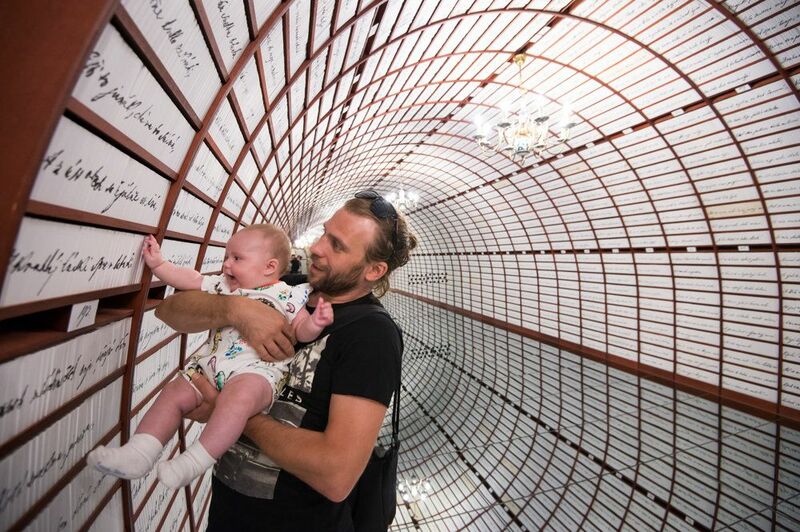 They believe the world’s longest love poem will protect their love forever.